NASA's Parker Solar Probe has completed its first full orbit around the sun. NASA's Parker Solar Probe has completed its first loop around the sun and entered the second of 24 planned orbits. The spacecraft launched on Aug. 12, 2018, and survived its first close flyby of the sun on Nov. 5 of last year, when it swooped within 15 million miles (24 million kilometers) of the star. As of Jan. 19, the probe has reached its farthest distance from the sun, called aphelion, before it goes in for another close pass on April 4. "It's been an illuminating and fascinating first orbit," Andy Driesman, Parker Solar Probe project manager and a researcher at Johns Hopkins University's Applied Physics Lab in Maryland, which built and manages the project, said in the statement. "We've learned a lot about how the spacecraft operates and reacts to the solar environment, and I'm proud to say the team's projections have been very accurate." "We've always said that we don't know what to expect until we look at the data," added Nour Raouafi, a project scientist on the probe who's also at APL. "The data we have received hints at many new things that we've not seen before and at potential new discoveries. Parker Solar Probe is delivering on the mission's promise of revealing the mysteries of our sun." The spacecraft's first approach broke distance records; humanity's previous record-holder for a close approach to the sun, Helios 2, dove to about twice Parker Solar Probe's distance from the star in 1976. Parker also busted speed records, blazing by at 213,200 mph (343,112 km/h) relative to the sun. On its second pass, the spacecraft will fly by at a similar distance, but in future orbits, it will break its own records, getting closer and closer to the sun. By its final planned flyby, in late 2025, the spacecraft will dive within just 3.83 million miles (6.16 million km) of the sun, accelerated by the star's gravity to nearly 430,000 mph (690,000 km/h). Data about the Parker Solar Probe as of Jan. 19, 2019, when it completed its first orbit of the sun. But for now, preparing for the spacecraft's second flyby, engineers are remotely emptying the probe of data that has already been transmitted to Earth. They're also sending updated position and navigation information, plus about a month's worth of command instructions, NASA officials said in the statement. 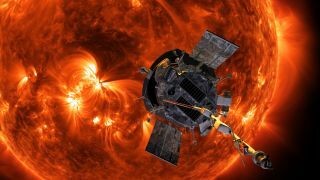 During Parker Solar Probe's 24 total flybys, its four instruments will help researchers understand the inner workings of the sun and how it accelerates solar material at high speeds, as well as what makes the star's outer atmosphere, called the corona, so much hotter than the solar surface. Email Sarah Lewin at slewin@space.com or follow her @SarahExplains. Follow us on Twitter @Spacedotcom and on Facebook. Original article on Space.com.